Be the first to share your favorite memory, photo or story of Ciro. This memorial page is dedicated for family, friends and future generations to celebrate the life of their loved one. Ciro Coppola, 87, died Monday, October 1, 2018. Born in Italy, he settled in Lyndhurst in 1957 and has lived in North Arlington since 1970. He worked for Penick Chemical Co. in Lyndhurst as a shop steward for 35 years before retiring 30 years ago. 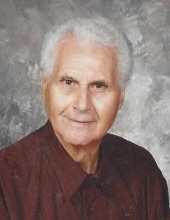 Ciro served as an usher at Queen of Peace Church , North Arlington, he was a member of the Queen of Peace Knights of Columbus Council # 3428, the North Arlington Elk’s Lodge # 1992 , and was a longtime lunch aide at the North Arlington Middle School. He was the beloved husband of the late Anna ( nee Buttaci ), the devoted father of Louisa M. Stringham and her husband Oliver, Josephine Coppola, Salvatore Coppola and his wife Christine, Annamarie Frey and her husband Richard, Michael Coppola, Juliette Finocchiaro and her husband Salvatore and Grace Busuttil and her husband Frank, the cherished grandfather of 17 grandchildren, the dear brother of Angelo and Stefano Coppola and the adored uncle of many nieces and nephews. Funeral from the Parow Funeral Home 185 Ridge Rd., North Arlington on Friday, October 5th at 9 a.m. thence to Our Lady Queen of Peace Church, North Arlington for the Funeral Mass at 10 a.m. Entombment Holy Cross Chapel Mausoleum, North Arlington. The family will receive friends on Thursday 4-8 p.m. In lieu of flowers the family would appreciate donations made to Hospice of New Jersey, 400 Broadacres Drive, Bloomfield, N.J. 07003 or Parkinson's Foundation , 200 SE 1st St., Suite 800, Miami, Florida 33131. To send flowers or a remembrance gift to the family of Ciro Coppola, please visit our Tribute Store. "Email Address" would like to share the life celebration of Ciro Coppola. Click on the "link" to go to share a favorite memory or leave a condolence message for the family.